Yokohama Pier and Port, Yokohama, Kanagawa Prefecture. 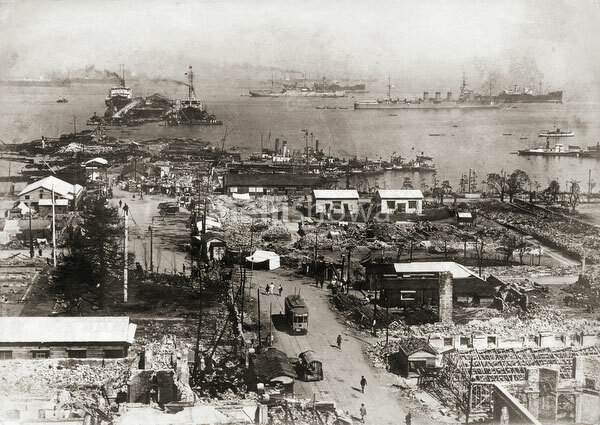 Devastation caused in Yokohama by the Great Kanto Earthquake (Kanto Daishinsai) of September 1, 1923 (Taisho 12). The quake, with an estimated magnitude between 7.9 and 8.4 on the Richter scale, devastated Tokyo, the port city of Yokohama, surrounding prefectures of Chiba, Kanagawa, and Shizuoka, and claimed over 140,000 victims.